Despite the fact that the 24th Century Starfleet was supposed to be lacking in military influence, the Enterprise did come with weapons both for the ship (or ships if you count the shuttlecrafts) and the crew. The next section of the writer’s guide goes into those weapons. It’s technically part of the “terminology” and there will be technobabble involved but how many more parts of that do you need? Plus the guide treats this as a separate section, thus so will I. This and next week’s look at the computer are going to be short. They’re one page a piece in the guide. There are three reasons why, and admittedly one of them is to pad out this series to go through the rest of December, not counting Christmas week stuff. The second is I’m expecting to have quite a bit to talk about while the third is that the guide decided to categorize them this way for a reason so I shall too. Therefore, let’s take a short look at the phasers and photon torpedoes of legend. If you never knew what exactly they were and how they work, we shall see if we get our answers tonight. The section begins by discussing the use of phasers. Our away team members and our ship’s security squads are equipped with two models of phaser. The hand-phaser is a small, but very powerful weapon. It is the same size of a pocket flashlight, but it packs as much firepower as a 20th century destroyer-killing missile. The pistol-phaser is a pistol-sized weapon with correspondingly greater power. I don’t know about you but I don’t remember a phaser pistol. I only ever saw them using the regular thing that looked like a cheap remote control for people less tech-savvy than my dad. I think they’re confusing it with the TOS phasers. (If you follow my other site you may remember I did a review of the replica toy.) For that version, the “pocket flashlight” would connect to the “pistol” and boost its power. Not only does the 24th-century phaser not appear capable of such modular add-ons, but Roddenberry and company insisted that the phasers NOT look like guns at all. I had to check Memory Alpha, the Star Trek fan wiki, to further investigate. Apparently, the “type-1” was so small that you couldn’t see it on-screen. It was (pardon the pun) phased out except for undercover assignments or when it needed to be hidden, like the TOS type 1, only the TNG version couldn’t connect to the larger pistol housing. The “remote control” (and I think they actually sold a TNG remote in that design) was the type-2. So you have something the size of that flashlight on your keychain with the ability to take down a battleship, and that’s the weak one. Want to know how bad it can get? The peace-loving Federation, ladies and gentlemen. And thank goodness for that. (I can’t thank God given that the 24th-century is a godless century. Probably because Kirk killed all the gods while acting as Satan’s PR rep. Seriously, “The Magicks Of Megas-Two” explains so much about Jim Kirk’s success when compared to the “gods” he met during his career.) You’d think that level of firepower would be reserved for the ship’s phasers, but we’ll get to them in a moment. First we need to find out what a “phaser” actually is. The phaser beam is a high-intensity beam of phased coherent light. In actual usage it scrambles the flow of electrical currents and light fiber currents. Can somebody translate that into English? Seriously, I realize science wasn’t my best skill in high school but that makes no sense to me whatsoever! Maybe Memory Alpha can explain this better? In the nadion particle beam phasers, plasma was passed to a phaser emitter resulting in a discharge of nadion particles. Residual particles could be found in places where a battle had recently taken place. The disruptive effects of nadion discharges were moderated to produce varying effects (discussed below), ranging from benign to extremely destructive. At low levels the phasers only stun a living being or disrupt a piece of machinery momentarily. They also have phaser drills. I wonder if they use phaser toothbrushes? By momentarily blowing it to bits? I don’t remember a time the phasers were used to stun anything other than living beings. Otherwise, it was blow up real good time. The guide says it’s a standing order to leave phasers on stun except when ordered otherwise. I guess that’s good, since everyone is carrying a handheld version of something more destructive than the Ghostbusters’ proton packs in their pocket! And people thought the cell phone would make gas stations explode? If hand-held phasers can cause all this damage what can the ships’ weapons do? Well, guess what the next section of the guide is. The ship’s phasers have all the power of the Enterprise‘s matter/anti-matter engines behind them. They are quite capable of disintegrating another Constitution class vessel–or even a small moon, if necessary. The original NCC-1701 was a Constitution-class so I wonder if someone forgot the change that with the new guide to “Galaxy class”? I think they actually said on the show that the Enterprise phasers could crack a planet, but I could be remembering incorrectly. 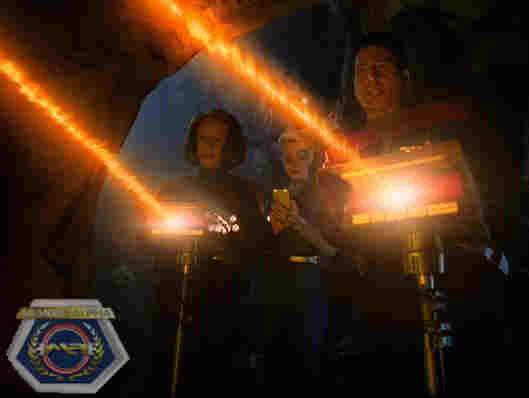 Anyway, because the phasers use light beams (I think) the guide states that they can’t be used as warp speeds, which remember is about going faster than light, so that’s what the photon torpedos are for. Except “photon” has to do with light so this is going to need some explaining. The photon torpedo is perhaps the single most powerful weapon available to the Enterprise. Again, the peaceful Federation. Their rifles can nuke LA but they come in peace. I kid, but it seems interesting that they have this much firepower and yet they tried to pull Starfleet away from military stylings. It’s like giving a nuke to Jacques Cousteau. It is a tiny piece of anti-matter held in a magnetic bottle. (ie the black casket we saw in the Star Trek movies.) A photon torpedo is built around a miniature warp engine and can be used to track and destroy an enemy vessel while either it and/or the Enterprise is traveling at warp speeds. Now that I could follow. So I’m guessing the casing can be altered for space burials like Spock’s in the movies. Either that or a mini warp engine was put into a casket. Is there anything not deadly on the Enterprise? Rifles that can level cities, caskets that can blow up a small moon, holodecks. Are we sure life in the 24th-century is something we really want to strive for? I think I’ll stay Earthside until aliens come looking to speak to an extinct animal that we have to go back in time for. That week I’m going to Risa. Yeah, I had a little fun with this one but given the internet’s reactions to transporters don’t be shocked if I just started a new meme set. Actually, be shocked because I’m not that popular. Next week we reach the final section worth talking about as we go over the ship’s computer. We can count up all the ways this will kill you too. Posted by ShadowWing Tronix on December 7, 2018 in Star Trek: The Next Story Bible and tagged phasers, photon torpedos, Star Trek: The Next Generation, story bible, writer's bible, writer's guide. Great piece! Funny and thought-provoking at the same time. Whoever has the most powerful weapons gets to define what “peace” is.